Be the Smartest Rafter on the River! 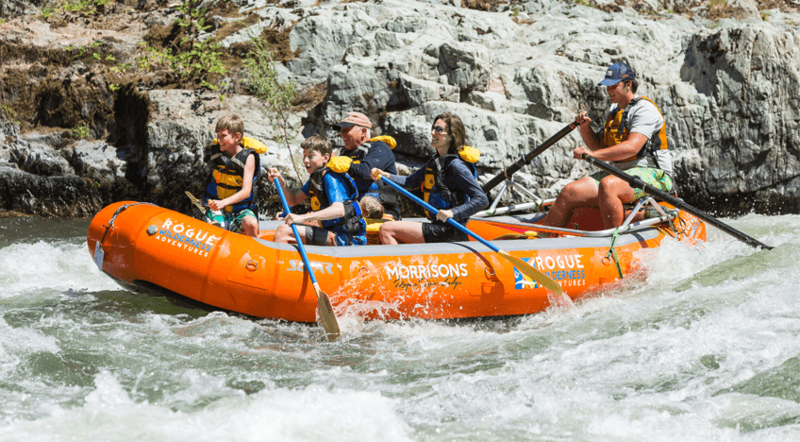 Here are answers to some of the most frequently asked questions on the raft, so you can have a leg up on your fellow rafters. 1. How deep is the river? A more complicated question than it seems! The river is not measured in depth, but instead in volume. The depth is ever-changing, not only because of rocks on the bottom, but also how wide it is. We measure river volume with ‘CFS’ or cubic feet per second – best understood by thinking of how many basketballs roll by any given line in the river in one second. The Rogue river runs on average between one and three thousand cfs, but has been recorded at over one hundred thousand cfs in the past! 2. How do we get back? A frequent variation on this question is: Do we finish where we started? The trip starts near Grants Pass, OR and follows the river in a westerly direction throughout the trip. At the end a RWA shuttle driver is there pick you up in a company vehicle and take you back to our starting point at the company. In the meantime, our parking lot is surrounded by a gate that is locked at night, and has someone at it 24/7, so you car is safe while you are on your adventure. 3. How do you classify rapids? Rapids are classified on a I-V scale. Each river guide has a slightly different way of explaining the classification system to you. I like to describe the system as being rated on ‘difficulty and consequence’, in other words ‘How hard is it, and what happens if I do it wrong?’ The system starts with Class I, which is a wide open flowing area on the river, and increases exponentially to Class V- extreme difficulty and/or danger. 4. Is the river harder when it is higher or lower? Well, both. When the river is lower, it flows much slower BUT has many more rocks to maneuver around. It might not be as fast and furious, but it is much harder to make it around all those pesky rocks that can get you stuck. When the river is high however, the rocks disappear creating a larger path for your boat to navigate through. Of course, you have about a third of the time and a bit more water in your eyes when you’re doing it, so it tends to be a bit more adrenaline charged. High water is often perceived as the more challenging of the two types of flow. 5. What if the boat pops? It won’t. Well, most of it won’t. The boats are made of 8 air chambers. Any one (or two..) could go and the boat would still be fine to finish the trip with a remaining 7 (or 6) chambers to keep it afloat. Also, the boats are made out of a VERY strong rubber or plastic and are very difficult to pierce. A knifes edge or a piece of railroad rebar could do the trick, but would still need quite a bit of force. Overall, popping of boats is very unlikely and unusual and should be at the bottom of the list of concerns on a river trip.